DONATIONS GRATEFULLY APPRECIATED TO ASSIST THE SPEEDY PRODUCTION AND TRANSLATION OF THIS CRITICAL RESOURCE. With solidarity for your upcoming actions, we have put together a guide on how to get information effectively during mobilisations, and in situations where you need to get out critical information. This is a rough guide – it is in no way definitive, nor does it override any local solutions. Nor do any suggestions reflect on any perceived or actual mistakes by anyone. 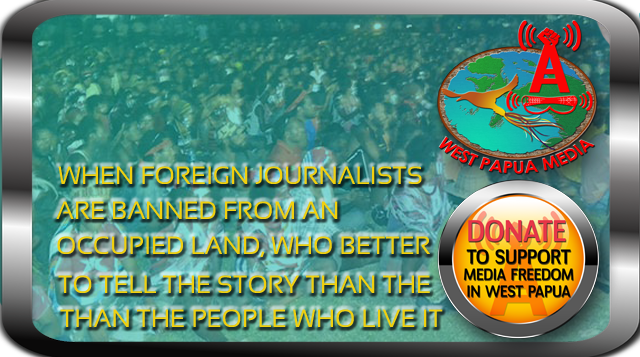 This is just a way forward for what we in West Papua Media Alerts need to get media disseminated outside of Papua. We would like to invite people to contribute, but safely. Please distribute this to your trusted networks. Tips for successful uptake of your media on your struggle! There are many barriers at the moment to getting the international media covering West Papua, and your struggle for peace and dignity. With Indonesia’s ban on allowing international monitors and journalists on the ground in West Papua, West Papuan people must provide a professional, credible, factual, and highly disciplined objective reporting mechanism to the world’s press. Instead of despairing the absence of international media, BE THAT MEDIA. But in doing so, you must make sure that you are able to do it credibly and deliver high quality reporting. Consider this an exercise in your self determination, and the continuing pathway you have already demonstrated to professional media development. This is annoying, but it must be said and done. English is the primary language of communication on Earth, much as us anti-colonialists dislike it. But almost all media must be translated into English. We get inundated with requests for translations, and our hard working translators cannot always deal with the workload. If you can send out already translated information in good English this would save us a lot of time, and may mean the difference between life and death in critical situations. Please help us to help you. What information do you need to give us? 1. Reliable and credible EVIDENCE!!! 4. Who Did What to Whom, When, Where, How and Why? All must be answered with just the facts, no padding and no spin. Without these as a minimum, MEDIA CANNOT UTILISE YOUR INFORMATION ETHICALLY OR LEGITIMATELY. SMS reporting just is not good enough. HELP THEM TO HELP YOU. So how do you get the info out in critical situations? * highly mobile and not wearing any clothing or markings that differentiate from any other member of the crowd (look as uniform as possible to everyone else – your media team must blend in to the background. * Have experience in communicating verbatim information and not changing the information they hear. * Have spare memory cards and adapters for cameras and video. * Each have several options per person for accessing internet, radio and phone services; The key here is redundancy, and having alternative and fluid sources of communication. Use a combination of modern adaptations and indigenous techniques. Remember THIS IS YOUR LAND and you have a lot of secret weapons from the land itself. * Who can access landlines and land based internet access – PREFERABLY NOTHING RESIDENTIAL OR CONNECTED TO A SINGLE IDENTIFIABLE PERSON. * Have backup plans for the physical couriering of information, tapes, evidence, digital media and files to networks outside the country. Taking two to three weeks for critical data is neither acceptable or useful. Speed is the essence. * For the communications bureau, they need to only use social media under an alias – never under their real name if they are on the ground. * Set yourself up an anonymous email address. Make sure all you address book data is pre-loaded into this account. A good tip is to have a lot of landscape or cultural festivity shots (mainly of the occupying colonist community) on your USB or laptop so that you can use them as cover if suddenly and intelligence officer or security forces show up, and start talking random soap opera gossip over the phone. This team will be a key target for security forces and may also have assistance from international intelligence agencies and signals interception, particularly from Australian and US military aid to Kopassus, so all people in this team need to fully aware that anything that is exposed of personal identity with will be used against them by the security forces, with all the risks that entails. You all need to accept that risk, or make significant steps to remaining anonymous. For a communications team to work effectively, it is highly advisable to maintain anonymity across the board and all sectors of activity. This can even (especially) extend to mannerisms or slang words, or phrases in speech and written language that are known to be attributable to certain people. You folks use social media extensively, but remember it is a tool for intelligence agencies, and very effective at that. If you must post do it with anonymity in mind. Video tips: How do you create a video that will be broadcast? To work better, it is best to do a couple of hours work now, so we have a slick package of grabs, showing a range of shots. * No files/grabs more than two minutes – makes it easier to edit and to send via internet. * Make sure you only get the dramatic highlights of visual action and KEY POINTS in the video. o iconic shots of powerful nonviolent resistance (like tribal people standing naked against Indonesian security forces in all their gear! We are assuming that you know how to capture the video onto your computer, or have someone nearby that can. It is critical that the files are saved in either avi or mov format, but you will need to compress it significantly to send it quickly and upload to the internet. Once you have compressed the file, please upload to a ftp server. You can upload for free to several sites, such as Sendspace.com, megaupload.com, badongo, or rapidshare.com. The free uploads will only last a short time (up to 48 hours) so immediately then send the upload link to West Papua Media at either video_upload westpapuamedia.info or to manukoreri at riseup.net . THIS IS VERY CRITICAL – YOUTUBE IS NOT THE IDEAL OPTION as the video quality is extremely poor. We would prefer that you send high quality video only. And we can then have the original to disseminate to media, AND then put on YouTube also. IF you want to have credit then let us know, and of course if any money is made then we can either give it back to you, or you can agree to put it into the West Papua Media project. (Please note – it is very rare that we ever get money for video, because if we charged money, international media would rarely use it. We have had to make that sacrifice in order to get your story out). I hope this is useful for you. If you do not understand anything, please do not hesitate to clarify this with us. Dengan hormat, dan sebagai tanda solidaritas teguh terhadap Anda dan aksi-aksi yang akan Anda selenggarakan, kami baru menyusun panduan tentang caranya terbaik mendapat informasi ketika ada aksi protes serta caranya menyalurkan berita penting ke dunia luar. Panduan tersebut belum sempurna dan tetap, berarti kalau ada solusi lokal yang sudah lama dipakai jangan sampai dibuang. Isinya panduan ini tidak berfokus pada kesalahan yang pernah dilakukan atau dikirakan dilakukan oleh seorang tertentu. Intinya hanya sekadar saran supaya kami di West Papua Media Alerts mendapat berita untuk disebarluaskan di luar Papua. Silakan beri masukan Anda, namun tetap waspadalah akan keamanan Anda masing-masing. Tolong sebarkan panduan ini ke jejaring dan komunitas Anda masing-masing yang terpercaya. Beberapa nasehat untuk sukses dalam menggunakan media demi perjuangan Anda! Sekarang hambatannya banyak sekali untuk peliputan keadaan di Papua Barat dan perjuangan Anda untuk perdamaian dan kemartabatan oleh media internasional. Oleh karena pemerintah Republik Indonesia tidak lagi mengizinkan pengawas dan wartawan asing bekerja di lapangan di Papua Barat, makanya orang Papua Baratlah yang harus memberikan masukannya yang profesional, kredibel, tepat dengan fakta, berdisiplin tinggi dan obyektif kepada pers dunia internasional. Jangan keluh lagi atas ketiadaan media internasional di Papua Barat, JADILAH MEDIA ITU. Tetapi dalam kegiatan itu, pastikanlah Anda benar-benar mampu menulis laporan yang kredibel dan bermutu tinggi. Anggaplah bahwa ini sesuatu latihan saja dalam rangka upaya yang terus-menerus mengembangkan media yang profesional demi mencapai cita-cita Anda. Pada dasarnya, laporan yang kami perlukan harus merupakan fakta murni saja. Jika Anda menyampaikan seruan, pendapat/tajuk rencana ataupun analisa, tetap akan kami publikasikan karena itu tetap merupakan berita. Namun seharusnya pemberitaan ini dipisahkan dengan laporan tentang peristiwa tertentu dan bukti pelanggaran HAM oleh aparat keamanan dan pemerintah. Kami tetap berusaha mengalih perhatian wartawan-wartawan internasional ke keadaan di Papua, tetapi mereka seringkali tidak jadi meliput dikarenakan minimnya berita yang dapat langsung terpercaya dan di-crosscheck dengan secepat-cepatnya. Adapun hal yang lebih penting: mestinya laporan Anda dibikin singkat, tepat, tanpa memakai banyak hiperbole. Garis besar harus ditulis dalam kurun waktu sepuluh detik dan ide-ide penting harus jelas, yaitu tidak bisa disalahpahami atau disalahartikan. Kami juga menyarankan agar Anda berdisiplin dan bersikap professional dengan mendapat dengan cepat berita yang terpercaya dan bisa di-crosscheck sehingga dapat masuk media internasional. SMS memang sangat berguna tetapi media internasional tidak pernah memberitakan peristiwa yang hanya dilapor melalui SMS yang diterimanya. Seperti Anda sudah ketahui dan walaupun kami sebagai antikolonialis menyayangkan keadaan itu, bahasa Inggris adalah bahasa komunikasi di seluruh dunia. Makanya semua berita harus diterjemahkan ke dalam bahasa Inggris. Kami sudah dibanjiri dengan permohonan terjemahan sehingga penerjemah kami yang rajin terkadang tidak dapat menghadapi tugas yang begitu berat. Oleh karena itu sebaiknya berita yang Anda sampaikan sudah diterjemahkan ke dalam bahasa Inggris yang baik dan benar sehingga kami bisa menghemat waktu dan menanggapi dengan lebih cepat ketika ada keadaan yang gawat. Ini membantu kami sekaligus Anda. Berita apakah perlu kami diberikan? 1. BUKTI yang kredibel dan terpercaya!!! 4. Siapakah yang berbuat? Kepada siapa? Kapan? Di mana? Bagaimana? Kenapa? Semua pertanyaan ini harus dijawab dengan hanya fakta, tanpa penjelasan yang terulang-ulang dan kalimat yang bertele-tele. 5. Pernyataan setidaknya tiga saksi yand berbeda dan TIDAK BERKAITAN satu sama lain. Andaikan syarat-syarat minimal ini tidak dipenuhi, MEDIA INTERNASIONAL TIDAK BISA MEGGUNAKAN BERITA ANDA SECARA ETIS DAN SAH. Laporan melalui SMS kurang cukup. MARI BANTU MEREKA MEMBANTU ANDA. Bagaimana menyalurkan informasi ke dunia luar ketika keadaan sedang gawat? * Disediakan kartu memori cadangan serta alat cas untuk kamera foto dan video. * Semua alat elektronik mesti dalam kondisi bisa dipakai dan dilengkapi dengan baterai dalam kondisi penuh serta SETIDAKNYA dua baterai cadangan. * Setiap orang seharusnya bisa mengakses internet, radio atau pelayanan telpon di beberapa tempat. Pada dasarnya seharusnya kemungkinannya akses banyak sehingga ada alat komunikasi alternatif yang lancer dan mudah dijangkau. Berkombinasilah teknologi modern serta teknologi tradisional yang tak kalah canggih. INI TANAH ANDA dan kami pasti Anda bisa memanfaatkan banyak trik khas Tanah Papua. * Memakai sebuah telpon genggam untuk menerima pesan dan sebuah ponsel yang lain untuk menelpon dan mengetik SMS. * Telpon genggamnya yang dipakai semestinya tidak didaftar dengan pakai nama seorang nyata. * Apabila Anda bisa mengakses internet melalui jaringan tetap, JANGAN SAMPAI DIPAKAI DI RUMAH PENDUDUK ATAU PRIBADI. * Sebaiknya dari awal dipikirkan jalur alternatif untuk penyampaian informasi, kaset, bukti, media digital dan file ke jaringan-jaringan di luar negeri. Waktu 2-3 minggu untuk menyampaikan berita penting tidak bisa diterima dan tidak berguna. Filsafat ala “alon-alon asal ke lakon” sangat merugikan untuk perjuangan Anda. * Khususnya untuk kantor komunikasi: jangan buka situs jejaring sosial dengan nama Anda yang benar, selalu pakai nama samaran, apalagi kalau Anda berada di lapangan. * Mendaftar dengan tanpa nama untuk membuka alamat email dan pastikanlah semua alamat email yang disimpan di konto email yang lain dipindahkan ke konto ini. * Semua foto dan video disimpan di dalam memori flashdisk – janganlah sampai disimpan di dalam memori laptop. Beberapa saran lain: Ambil banyak foto lanskap atau pesta tradisional (tradisional untuk orang pendatang) untuk disimpan di dalam flashdisk atau di dalam memori laptop Anda sehingga tidak dicurigai jika seorang intel atau seorang anggota aparat keamanan tiba-tiba muncul. Kalau terjadi pada saat sedang memakai telpon, mulailah mengobrol tentang gosip-gosip selebriti, bola atau sinetron saja. Tim komunikasinya akan menjadi target penting untuk aparat keamanan yang mungkin diperbantukan badan intel internasional dan alat penangkap sinyal, seperti Kopassus yang diperbantukan tentara Australia dan AS. Oleh karena itu, anggota tim harus sadar bahwa segala-galanya dari identitas pribadinya yang diekspos dapat dimanfaatkan aparat keamanan dalam melawan mereka. Semua anggota tim mestinya sadar adanya resiko itu atau tetap berusaha menjaga anonimitas masing-masing. Supaya bertugas dengan efisien disarankan agar tim komunikasi waspada menjaga anonimitas baik di tempat kerja maupun di kehidupan sehari-hari, terutama dengan menahan diri memakai kata-kata, peribahasa, nama panggilan atau bahasa slang yang ciri khas sebuah kelompok tertentu. Anda memang pengemar berat media sosial, namun ingatlah itu juga sering digunakan oleh badan intel. Kalau mau membuka situs itu, tetap coba jaga anonimitas. Nasehat tentang video: Bagaimana diciptakan video yang akan disebarkan? Untuk bekerja dengan lebih baik, disarankan agar berlatih selama satu-dua jam sekarang sehingga didapat banyak rekaman dari bermacam-macam sudut. * Jangan pakai rekaman yang berdurasi lebih dari dua menit karena di bawah itu lebih mudah disunting dan dikirim melalui internet. * Pastikanlah hanya SAAT-SAAT PENTING aksi direkam dalam video. * Maaf, kami kurang tertarik pada pidato kecuali rekamanya tidak melebihi sepuluh detik. o Salah satu cara terbaik untuk menciptakan media video yang menarik misalnya meliput saat-saat penting satu hari dalam kehidupan seorang pemimpin aksi protes. Kami menduga bahwa Anda sudah tahu bagaimana rekaman video bisa disimpan di dalam memori computer atau bisa dibantu seorang teman dalam tugas itu. Seharusnya file video disimpan dengan format .avi atau .mov, namun file-nya tetap mesti dikompresi untuk dikirim dan di-upload di internet dengan cepat. Setelah file videonya dikompresi, harap di-upload ke ftp server. Banyak situs yang bisa dimanfaatkan untuk upload gratis: Sendspace.com, megaupload.com, badongo ataupun rapidshare.com. Biasanya upload gratis hanya terbuka selama kurun waktu yang agak singkat (paling lama 48 jam), jadi harap link upload-nya segera dikirim ke West Papua Media (video_upload westpapuamedia.info atau manukoreri riseup.net). PERHATIAN KHUSUS – YOUTUBE BUKAN SOLUSI YANG TERBAIK dikarenakan kwalitas videonya buruk sekali. Kami harap hanya video dengan kwalitas tinggi yang dikirim untuk disalurkan ke media internasional dulu, selanjutnya ke YouTube. Jika Anda ingin nama Anda muncul sebagai kamerawan/wartawan, silakan beritahukan kami. Apabila rekaman bisa dijual, wajarlah kalau uang dikirim ke rekening Anda atau, kalau Anda setuju, disumbang ke proyek West Papua Media (Penting: Mendapat uang untuk video memang sangat jarang, karena media internasional tidak mau memakai video itu kalau wajib dibayar. Itulah pengorbanan kita semua demi menyebarluaskan cerita-cerita penderitaan rakyat Papua). Mudah-mudahan panduan itu dapat berguna untuk Anda. Seandainya Anda kurang mengerti sesuatu, jangan ragu-ragu kirim email kepada kami untuk keterangan lebih lanjut.